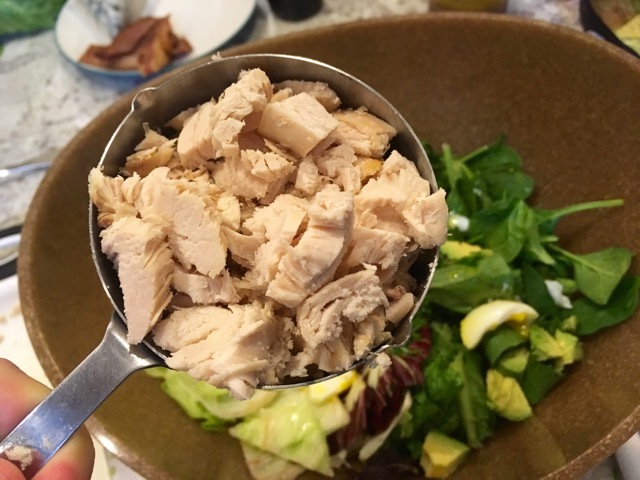 Cobb Salad (and French Dressing) | And Such Small Portions! When I think about it now, the orders made a certain kind of sense. You don’t want to eat too heavy at a power lunch (another odd thing about L.A.: people still have power lunches! ), but you also don’t want to come across as overly ascetic. Enter the Cobb, a muscular concoction that checks every necessary box: rich but virtuous, simple but colorful. 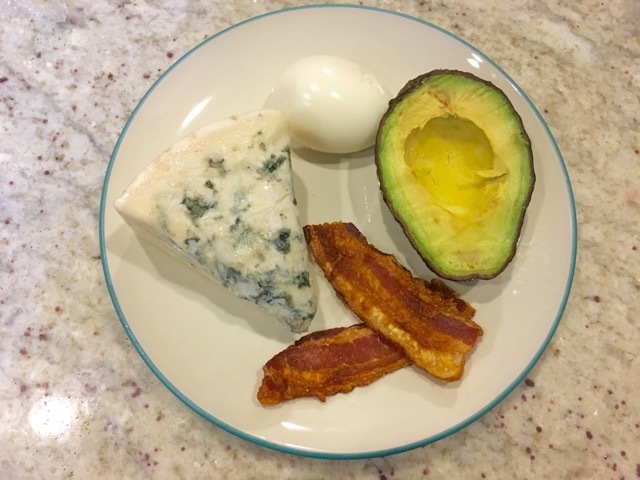 A Cobb can be strictly traditional, but its basic form is adaptable enough to accommodate all sorts of additional ingredients; the only things that are non-negotiable, in my mind, are the presence of avocado, bacon, and some kind of blue cheese. 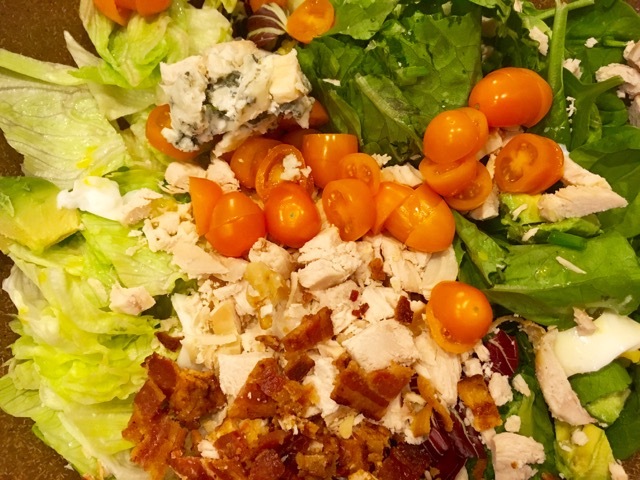 All three are accounted for in the original Cobb salad recipe, as codified in the 1930s by the Brown Derby restaurant—which is, of course, in Los Angeles. 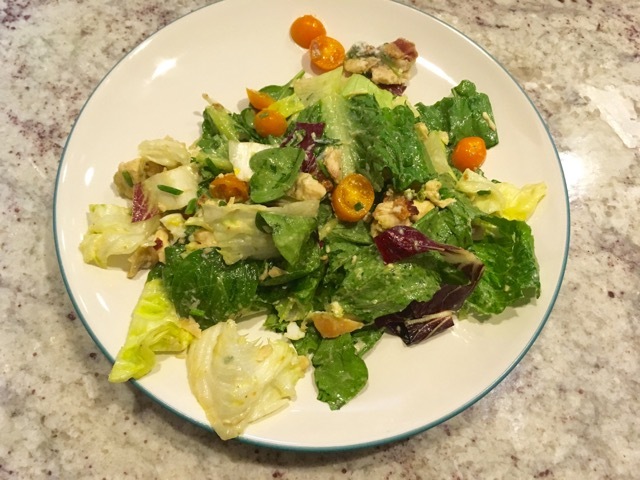 Nonnie’s take on the salad is fairly close to the Brown Derby’s, from the variety of lettuces used to the “French dressing” that ties it all together—not, thank God, the disgusting, ketchup-y, orange goop we associate with that term, but a slightly souped-up vinaigrette. Any L.A. macher would be happy to broker a deal over it—preferably while sitting next to a very out-of-place east coast transplant. Special French dressing, recipe below. Chop salad greens into very small pieces and place in salad bowl. Add chives, chicken, sliced eggs, diced avocado, and tomatoes. Spread cheese on top. Chill. Just before serving, toss with French dressing. Combine all ingredients and mix well with a whisk. Cover and chill. Shake or mix well before using. Makes 1 1/2 cup. The verdict: I was expecting to like the salad, but worried that the dressing would be overly oily. I shouldn’t have: as written, the dressing is actually surprisingly punchy, though it could have used more of everything besides the vinegar, oil, and sugar. Even when I added a whole clove of garlic, it still wasn’t particularly assertive—though at least it had enough acid to balance out the salad’s multiple fatty ingredients. Speaking of which: it takes a decent amount of time to assemble and prep all those bits and pieces, longer than you might be willing to spend on making a salad. Persevere, though, and you’ll be rewarded with the most powerful of power lunches—or a surprisingly satisfying dinner. And you won’t even need to sit through an hour of glad-handing to get it.